An excerpt from a larger piece from originally published in 2009. Was Tchaikovsky gay? Or did his heart break when his fiancée married another man? Did he kill himself by drinking a cholera-tainted glass of water? Whatever sells the greatest number of tickets. Which is not as insipidly utilitarian as it sounds. The first part of this survey looked at how movies have mocked the conventions of high culture in music, rejecting its stuffy, elitist ethos. But how do Hollywood and its ilk try to explain the power of music? When looking at the lives of composers and performers, most filmmakers take the easy route. Suffering, particularly of the romantic or Romantic kind, is essential. At the beginning, a sweeping Romantic full-bodied orchestral style swept through and became the norm for studio releases. When sound came in, the search for topics for musical/historical epics naturally turned to the more tragic figures in the composers’ ranks, and cleaned-up, heroic versions of their lives became the Disneyfied norm. Who had the best story? Tibbetts sees with utter clarity the pressures that the narrative form imposes on the central mystery of artistic creation, acts which seek to foil time and transcend mundane boundaries. The dramatic arc demands that the protagonist struggle and suffer and overcome, or don’t, the vagaries of an indifferent world. Considering that over Tibbetts found OVER 300 film biographies of composers, it’s safe to say I can’t begin to touch that trove or tragedy, travesty, and tunefulness. Charitably, he rejects the validity of criticizing any of the films on the basis of historical accuracy. “It was no use trying to reconcile story with history. It was a lot more rewarding to enjoy their doubled pleasures as a synergy, a cooperation, a polyphony of separate but related elements,” he writes. That lets a lot of stinkers in, and all manner of revisions. But it also opens the door for the unorthodox but richly rewarding musical biographies directed by Ken Russell and Tony Palmer. Mahler (1974) Dir: Ken Russell. Whether Russell (“Tommy,” “Altered States”) will ever be seen as a cinematic genius or simply dismissed as a garish provocateur remains to be seen. For those who can handle his over-the-top approach, films such as this in his gallery of composer portraits are mind-bending concoctions – hallucinatory extrapolations of his subjects’ inner lives. Even in this permissive era, some of these films are still locked away, forbidden to be seen by the public. When will we get a chance to evaluate them? Meanwhile, disturbing gems such as this still provoke disgust and wonder. Robert Powell, who is otherwise best known as Zeffirielli’s miniseries Jesus, is perfect as Mahler. A Good Dissonance is Like a Man (1977) Dir: Theodor Timreck. This beautiful little hour-long TV documentary is an illumination of the life of American composer Charles Ives. It’s impossible to find save through a public library, but it is well worth the search. Ives’ difficult and original sound was almost universally ignored during his lifetime – this piece shows us why, and why that was a fate undeserved. 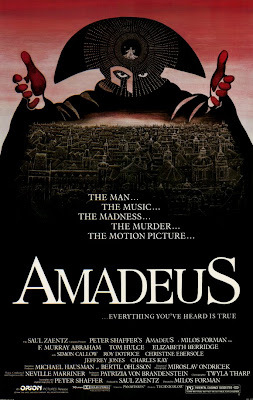 Amadeus (1984) Dir: Milos Forman. Peter Shaffer’s brilliant 1979 play is not really a bio of Mozart – rather, it revives the myth that musical contemporary Antonio Salieri despised the genius and drove him to his early death. It does so as part of a larger meditation on genius and God – and British acting legend Paul Scofield gave an amazing performance as Salieri in the original production. F. Murray Abraham’s performance is distinctly different for film, but it won him the Academy Award for Best Actor that year nonetheless. The movie won seven more Oscars, including for Best Picture. It earned them. Testimony (1987) Dir: Tony Palmer. 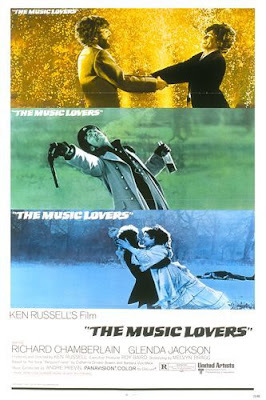 Palmer, although an associate of Ken Russell’s, has a distinct and compelling vision of how to illustrate musical lives. (His nine-hour “Wagner,” Richard Burton’s last great film role, has never really been examined in America.) Here his subject is Dmitri Shostakovich, the Soviet composer who fond himself alternately praised and condemned by Stalin and his minions during his career. The film is based on a highly controversial, strongly disputed memoir edited by Russian musicologist Solomon Volkov. The epic, with a great performance by Ben Kingsley at its heart, combines naturalism, surreal sequences, and paste-up techniques to provide a portrait of a man in constant fear for his life as he tried to mediate between his creativity and political correctness. 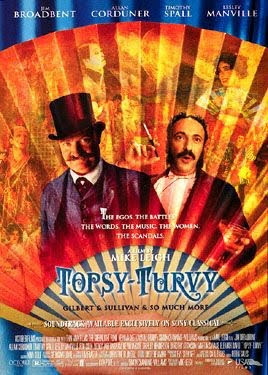 Topsy-Turvy (1999) Dir: Mike Leigh. Gilbert and Sullivan these days, if they are remembered at all, are thought of as a safe and comfortable (and boring) pair of entertainers. Still, Sullivan’s music is solid and artful, and Gilbert’s thinly disguised satires of English life were quite barbed. Leigh, who normally tackles everyday, contemporary dramas and comedies (“Happy-Go-Lucky,” “Secrets and Lies,” “Naked”), turned to the Victorian era in this marvelously observed work. It follows the travails of Gilbert and Sullivan and company as they craft “The Mikado” in 1884. Leigh uses a stable of relative unknowns (Jim Broadbent, Alan Corduner, Timothy Spall, Shirley Henderson, to name a few) to create an ensemble effect that captures both the ups and downs of theatrical life and the peculiar hypocrisies of English society during the period. There’s a darkness in this film that just won’t go away.